Hi everyone! Today's nails are for the skateboarders that I'm hanging out with tonight....Chris, Mark, Chuck, etc. I did the BONES Wheels logo. :) I hope they dig em!! (I get to meet Hank the puppy and eat grilled brats, too----these guys are the kings of grilling!) :-D YUM! 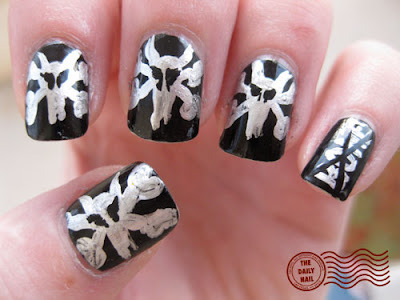 wow... even though I've been checking out this blog for ages, I'm still impressed by how you can draw things using NAIL POLISH. LOL. Those are awesome! Amazing skills girl! The picture is a bit blurry.. I can't believe I'm the first to comment on this, but did anyone else mistake "eat grilled brats" as children, not bratwurst?